Objective 3: Ensure that federal programs and health IT tools support the oncology workforce as it delivers care. Effective delivery of care across the cancer continuum is dependent on an engaged, productive workforce. Those involved in cancer care, like all health professionals, have had to adapt to massive changes in healthcare over the last several years, some of which have had a negative impact on the experience of providing care. The rollout of EHR systems, in particular, has contributed to providers’ frustration and burnout. [2,3] Physician surveys have identified a number of ways in which EHRs significantly worsen professional satisfaction (see Sources of Providers’ Dissatisfaction with EHRs). [4-6] Among respondents to a 2015 American Society of Clinical Oncology survey of oncology practices, implementation and use of EHRs was the most commonly cited practice pressure, outranking payer pressures, staffing issues, and drug pricing. The transition to EHRs will not be reversed, and few physicians wish to return to paper-based medical records. However, the significant challenges that have arisen during the initial rollout of EHRs should be addressed, and more work is needed to ensure interfaces are intuitive and aligned with care teams’ workflows. Recent survey results suggest that progress is being made, as satisfaction with EHR systems has increased over the past few years among physicians in larger practices. Many members of the healthcare delivery team already enjoy some advantages of EHRs—such as remote access to patient data, electronic prescribing, integrated graphing tools that display changes in disease markers over time, and improved communication with patients and other team members. [4,6,9,10] Additionally, most providers believe EHRs have potential to support improvements in both patient care and physician professional satisfaction. Improvements in interoperability, as discussed in Objective 1, will further increase the utility of EHRs for providers by automating data flows between laboratories and offices/hospitals. Nevertheless, additional efforts are needed to ensure that federal programs and health IT tools support the oncology workforce as it strives to deliver the best possible care. Action Item 3.1: Federal incentive programs should promote use of health IT to enhance provider delivery of high-quality, patient-centered care. In January 2016, the Office of the National Coordinator for Health Information Technology (ONC) and the Centers for Medicare & Medicaid Services (CMS) publicly agreed that federal EHR incentive programs should be modified to allow providers flexibility in their use of health IT and measure success based on the quality of patient care and outcomes. Efforts currently are under way to modify the incentive program for those who give care to Medicare beneficiaries to reflect this focus (see Medicare Access and CHIP Reauthorization Act of 2015 ). The President’s Cancer Panel supports efforts to reform federal incentive programs for EHR adoption and use. Regulations should not distract providers from patient care. Inherent in this, reporting requirements should be minimized. A new Medicare EHR incentive program for clinicians currently is being developed under the Medicare Access and CHIP Reauthorization Act of 2015 (MACRA). MACRA calls for a Merit-Based Incentive Payment System to measure eligible professionals based on quality, cost, technology use, and practice improvement rather than on the volume of services provided. Although the details of the program are still under development, the proposed rule calls for clinicians to report customizable measures that reflect how they use technology in their day-to-day practice, with a particular emphasis on interoperability and information exchange. Action Item 3.2: EHR vendors and healthcare organizations should employ human-centered design principles to ensure that EHR interfaces are intuitive and aligned with providers’ workflows. Better medical record systems are needed that are dissociated from billing, intuitive and helpful, and allow physicians to be fully present with their patients. Many provider complaints about EHRs relate to poor usability and misalignment of interfaces with clinical workflows (see Sources of Providers’ Dissatisfaction with EHRs). This may be, in part, because systems were designed to optimize billing rather than clinical care. Physicians report spending more time on clinical documentation following EHR adoption, which often results in less time for direct patient care, less patient engagement during visits, and more time spent on data entry outside of normal office hours. [3,4] Poor health IT usability also can undermine data quality and contribute to medical errors, a significant problem in the U.S. healthcare system. [17-19] In a review of extant EHR systems by the National Research Council, informatics experts reported that many of these systems failed to improve patient outcomes precisely because they failed to provide value-added support to healthcare delivery team members, patients, and their caregivers. Poor EHR usability is a significant barrier to deriving value from the sizable U.S. investment in health IT and advancing connected health for cancer. EHR vendors and healthcare organizations should employ human-centered design processes during EHR development, as well as during deployment and testing phases, to ensure EHR interfaces are intuitive and aligned with providers’ workflows (see Human-Centered Design). Well-designed systems should reduce providers’ cognitive burden by automating routine tasks, minimizing the number of clicks it takes to complete an order, and adding point-of-need information for crucial decision making. Human-centered design is a systematic approach to problem solving that is well suited for addressing complex issues at the intersection of people and technology. It encourages developers to repeatedly consider the context, emotions, needs, and desires of the intended users of a product and engages end users in the design process. Action Item 3.3: Develop and test tools and interfaces, including apps, tailored to needs of the oncology workforce. 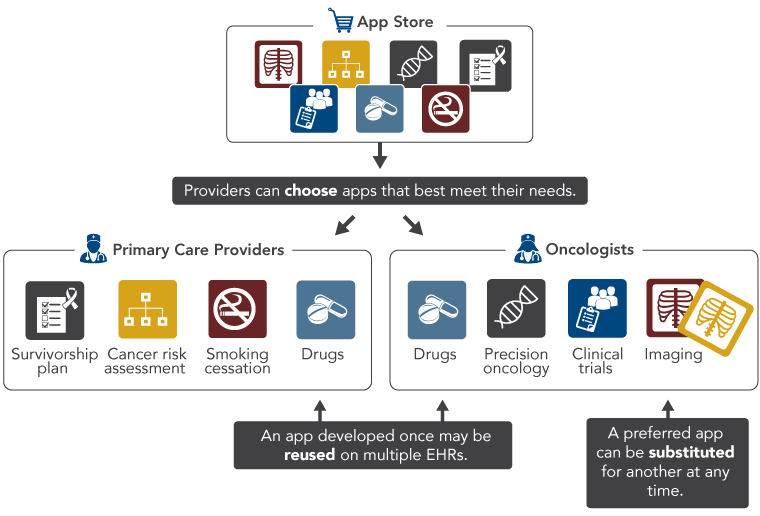 Innovative health IT tools and interfaces, including apps, could supplement traditional EHR interfaces in a number of ways, such as integrating and displaying data in meaningful ways, providing links to outside resources and knowledge bases, guiding delivery of evidence-based care, providing decision support, and facilitating communication among healthcare delivery team members. Tools that analyze large data sets and provide actionable recommendations based on the results—perhaps using artificial intelligence or machine learning—will become more valuable, even essential, with the emergence of data-driven precision medicine (see Precision Medicine Initiative in Part 1 and Cancer Moonshot in Objective 5). These types of tools have potential to meet the specialized and diverse needs of the oncology workforce across the cancer continuum (Figure 2). To date, most tools developed have been for physicians, but other healthcare professionals who care for cancer patients—nurses, advanced practice providers, pharmacists, and others—also would benefit from customized tools. Effective health IT tools can be developed by healthcare organizations and EHR vendors, but the needs of the oncology workforce will be met most effectively if the full innovative capacity of the health IT community is harnessed. To enable this, EHR vendors and healthcare organizations must permit third-party health IT developers to safely and securely access their EHR data through application programming interfaces, or APIs (see Objective 1). Developers then will be able to develop a diverse suite of apps from which providers can choose based on their needs and preferences (Figure 6). Apps can be developed and modified more quickly than traditional EHR interfaces, allowing the marketplace to keep pace with advances in medical science and be responsive to providers’ feedback. Online resources—such as the app discovery site being developed by Boston Children’s Hospital with support from ONC—can help providers find the apps and tools that best meet their needs. Within the past few years, some EHR vendors have begun working collaboratively to expand API-mediated access to their systems. ONC’s recent decision requiring health IT developers to include API functionality in their products and openly share API specifications in order to be certified will further increase third-party access to EHR systems. API-based apps for providers are being developed and tested (see Precision Cancer Medicine App Helps Oncologists Use Genomic Information and Syapse Oncology), but more investment is needed in this area. The President’s Cancer Panel urges research funding organizations, such as the National Cancer Institute, to create initiatives to spur development by the health IT community of cancer-specific apps and tools for providers delivering cancer care across the continuum. The efficacy of tools and apps, particularly those designed to influence provider behavior, should be evaluated in order to identify the approaches that are most effective in a variety of settings and populations. Genomic data increasingly are informing treatment decisions for cancer patients and those at risk for cancer, but commercially available EHRs generally cannot display clinical genomic data in meaningful ways. The Precision Cancer Medicine (PCM) app was designed to present patients’ genomic test results to oncologists in real time as a component of clinical practice, as well as provide links to external knowledge bases that otherwise would be unavailable through the native EHR system. PCM was piloted at Vanderbilt University and integrated into that institution’s EHR system. However, because the app was developed based on an open-access API (Substitutable Medical Applications and Reusable Technology, or SMART) and uses the emerging HL7 Fast Healthcare Interoperability Resources standard, it could easily be deployed for other compatible EHR systems. Syapse, a bioinformatics company founded in 2008, has developed a software platform that helps healthcare organizations systematize precision oncology. The software integrates with organizations’ EHRs and creates a unified, longitudinal view of each patient’s clinical, pathology, radiology, treatment, and molecular data. It also provides clinical decision support, suggesting targeted therapies based on patients’ genomic data, and permits providers to compare their patients with others within their organization based on tumor type, stage, genomic variants, and other factors. The Syapse platform also includes an automated clinical trial matching tool that identifies candidate patient-trial matches based on somatic mutation profile, clinical data, demographic information, or other criteria. In response to Vice President Biden’s Cancer Moonshot, Syapse also is working with multiple partners to make aggregate clinical data available for research through the Oncology Precision Network (OPeN). Sources: Syapse. Home page [Internet]. Palo Alto (CA): Syapse; [cited 2016 Sep 9]. Available from: http://www.syapse.com/; Bin Han Ong M. Stanford, Intermountain, and Providence use Syapse platform to integrate their data. The Cancer Letter. 2016 Jun 24;42(25):1-6. Wachter RM. The digital doctor. New York (NY): McGraw-Hill Education; 2015.